The Youngstown State University football team (0-1) entered Saturday’s game against the University of Pittsburgh (1-0) looking to continue its’ success from a deep playoff run in 2016. 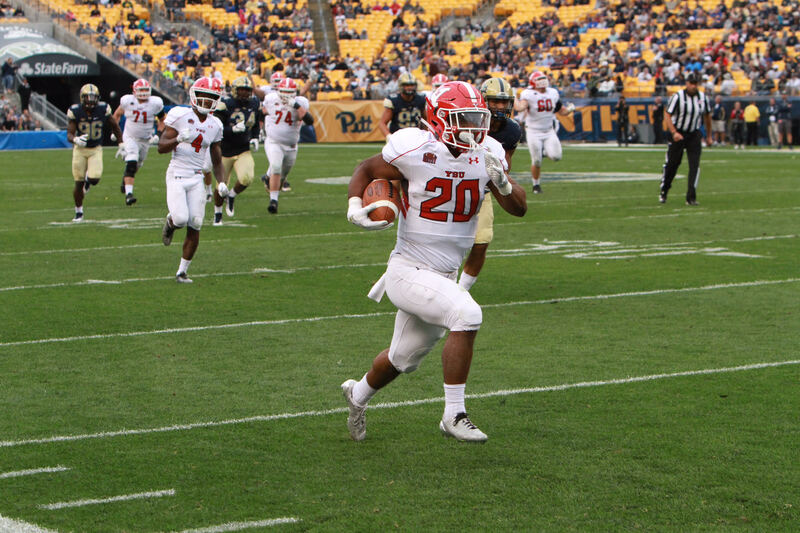 YSU fell at Heinz Field 28-21 in overtime. Pitt now leads the all-time series 4-1. YSU won the toss, but deferred possession to the second half. The Panthers started the game with an 11-play, 71-yard drive capped off by a 6-yard rushing touchdown from running back Qadree Ollison to put Pitt up 7-0 with 9:48 left in the first quarter. After a short YSU drive stalled, Pitt took over possession on its own 12-yard line and continued to punish the Penguins with the running game. A 5-yard rush from Ollison found the end zone and stretched the Panthers’ lead to 14-0. The score remained 14-0 at the end of the first quarter. Pitt led the game with 76 passing yards and 83 rushing yards. The Penguins opened up the second quarter with a crucial conversion on fourth down to keep the drive alive. Just a few plays later, kicker Zak Kennedy missed a 43-yard attempt wide to the left. Following the missed field goal, the Panthers marched down the field on a 16-play, 74-yard drive that lasted 8:47. A 1-yard touchdown run by A.J. Davis increased the Pitt lead to 21-0 with 3:07 left in the first half. Pitt led the first half with 239 yards, 146 of which were on the ground. YSU had 130 total yards but -1-yard rushing. YSU made its first stop of the game on the next Pitt possession, forcing the Panthers to punt it with 10:06 left in the third quarter. YSU took over on its own 10-yard line. It began an 11-play, 90-yard drive that was capped off by a 1-yard rush from Tevin McCaster that cut the deficit to 21-7 with 4:44 left in the third. The score was 21-7 at the end of the third quarter. YSU attempted a trick punt play that was returned for 66 yards to the YSU 4-yard line during the first drive of the fourth quarter. The Penguin defense held strong for a 3-and-out series. Pitt kicker Alex Kessman missed a 28-yard attempt that hit the right goal post. The momentum shifted the Penguins’ way after the missed field goal. Both the YSU rushing and passing attack heated up during a 9-play, 80-yard drive that ended with a 25-yard touchdown pass from quarterback Hunter Wells to true freshman running back Christian Turner. The back-to-back scoring drives trimmed the Panther lead to 21-14 with 6:10 left in the game. Pitt took over possession at its own 30-yard line and drove the ball to midfield. Later in the drive, Panthers quarterback Max Browne dropped back to pass on third-and-3 but was strip sacked by YSU defensive end Justus Reed who recovered the fumble. Two plays later, Wells completed a 42-yard touchdown pass to Turner which tied the game at 21-21 with 3:35 left in the fourth quarter. Pitt answered with an 11-play, 55-yard drive that set up Alex Kessman with a 38-yard field goal attempt to win the game. He missed the field goal wide-right and sent the game into overtime. The Panthers started the overtime period with the ball and completed a successful drive on a 11-yard touchdown pass from Browne to wide receiver Jester Weah. YSU took over needing a touchdown to send the game into a second overtime. The game ended on the fourth play of the Penguins’ overtime possession when Wells overthrew a pass intended for wide receiver Alvin Bailey that was intercepted. The Penguins will host Robert Morris University at Stambaugh Stadium for the home season opener on Saturday, Sept. 9. Kickoff is scheduled for 2 p.m.